Vinyl floors are durable, inexpensive and easy to install. Peel-and-stick vinyl tiles have pressure-sensitive adhesive to bond adhesive to the substrate, but the tiles must be rolled after installation. Some installers recommend using a 100-pound roller for the job. If you're willing to use a little muscle, you can employ other options for rolling your vinyl floor. Vinyl floors come in a wide array of colors and styles. Most home improvement stores rent 100-pound rollers for around $15 a day, as of 2011. If you can't find one, try other options. Joseph Truini of "This Old House" magazine recommends a bakers rolling pin for rolling out vinyl floors. If you don't want to do the work on your hands and knees, you can also use a J-roller, a plastic laminate roller attached to an extendable handle. You can purchase J-rollers at most hardware stores. For a rolling pin or J-roller to be effective, you'll need to use your body weight to compress the tiles. Shift forward on your knees if you're using the rolling pin or lean on the J-roller to effectively use your body weight. Roll from the center of the floor to the edges, rolling over every tile thoroughly. For proper adhesion, roll the floor no more than one hour after installation. Lay out the tile first to help you get an idea of where you'll need to cut tiles and what problems you may encounter. Use chalk lines to divide the floor into quadrants and finish laying tile in one quadrant before moving to the next. After installation, don't wash your floors for at least five days to ensure a good adhesive bond. 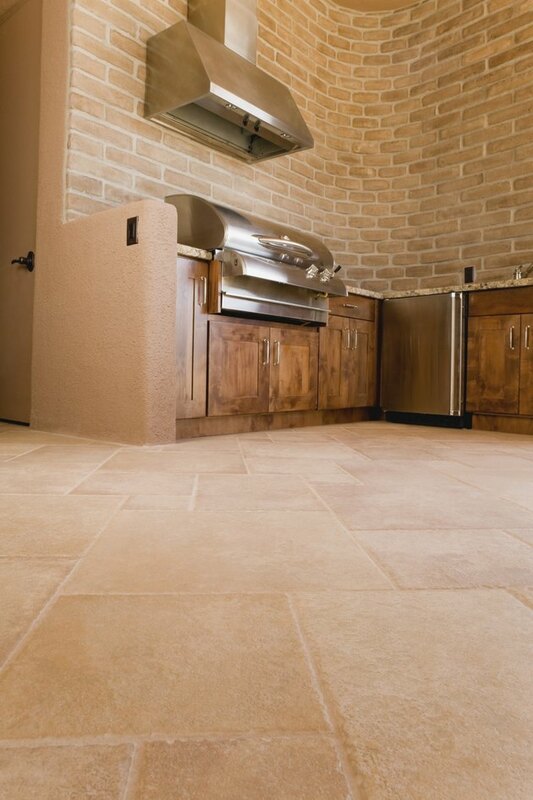 Softer underfoot than wood, stone or ceramic, vinyl offers comfort and durability. Modern vinyl is cushioned and cozy along with its resistance to dents, tears and spills. Vinyl is so resilient that many manufacturers offer lifetime warranties for their products. In addition, vinyl comes in a color and style to fit nearly every home and budget. For health-conscious consumers, vinyl products are being developed to meet tough, indoor air quality standards.